Water from your Mountain Fresh Canada water filtration system is safe to drink in the event of a boil water advisory. Imagine having instant near-boiling (200 degrees F) water at your fingertips. At 60 cups/hour and using a standard 115 volt outlet, this 2/3 gallon tank can be connected to the Mountain Fresh filter system for no additional cost. 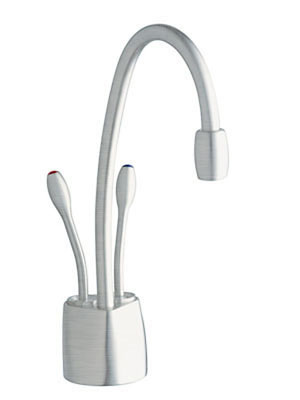 An InSinkErator hot water dispenser makes coffee, tea, hot cider, hot chocolate or any hot drink - instantly. Need to get something done? An instant hot water dispenser can help you: cook pasta al dente, blanch vegetables, melt chocolate, thaw frozen foods, serve hot cereals; loosen jar lids, remove labels, candle wax residue, baked-on foods or tomato skins; polish silver or jewelry; and warm plates, ice cream scoops or baby bottles. * Unit needs a continuous power supply and as such will not function on the same outlet as a food waste disposer controlled by a switch. Contact a qualified electrician for more information.